this idea is so important to “practice”…. 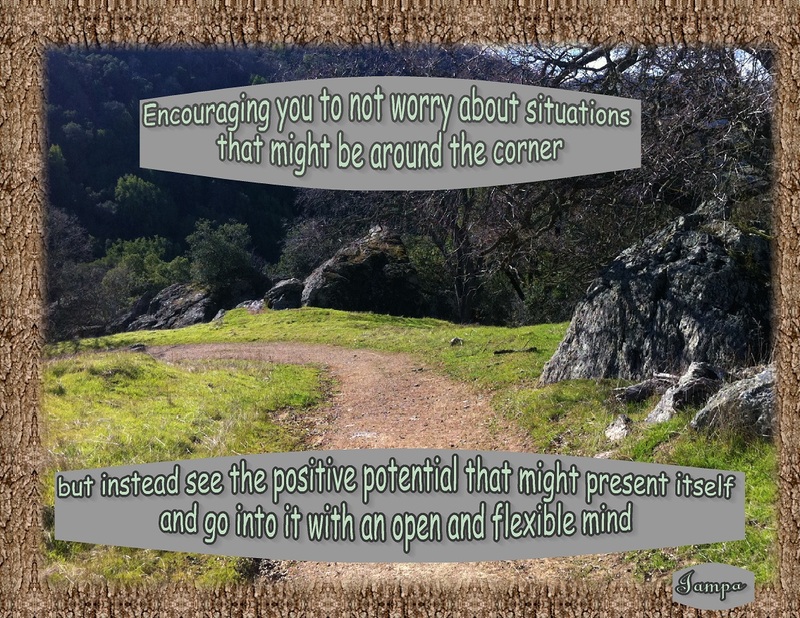 the many and varied possibilities…. To remind oneself again and again and again…. And as much or often as we can…. This entry was posted in Encouragement, Intention and tagged Encouragement, Inspiration, Life, Mindfulness, Motivation, Spirituality, Wisdom. Bookmark the permalink. Yes the knowing and believing in all things positive Very nice post. Even the worst of times can open doors to the best changes/opportunities we can hope to experience. For every fall there is a spring. I’ve had many an experience of falling down, dusting off and getting back up and walking to the best of all circumstances. it’s something we all to be reminded of, to look for opportunities and good things coming in our way in the midst of change instead of freaking out! heh heh. I think, for many of us, this is our first response and we can always use to be reminded to look for the good, for the positive potential of each day. Kathy, I have a tendency of worrying about the future and I know it’s not healthy for the mind and body, so this practice to expect the best is a good habit to cultivate. Thank you for that sweet response. I am heading over to the link you suggested with great anticipation. Out all that I wrote you pick up on the fact that I tend to worry, that its my one thorn is so perceptive of of you. I wonder if you should also add the word perceptive to your blog title. Perceptive Pockets Perspectives. Then we could call it the Tri-P’s. Life takes practice and patience . . . we must keep bringing ourselves back to the task. yes, resting in the moment…or keeping going in the moment!…practice and patience, indeed! You are always so helpful..Thank you! Hi Roberta…you’re very welcome…I’m happy to share what’s been offered to me, or ideas that I come up with…it seems that many of us are in the midst of…or approaching…. some changes…well, I guess that’s part of life, isn’t it?…so ideas about approaching changes in a positive manner seems to be a common thread. Wouldn’t that be wonderful if we could all learn to live each day like that…it sure is a worthy aspiration, as far as I’m concerned!